Hello one and all! I'm back from Basel and pleased to say that I saw Federer take down Nadal to win his 7th title in his hometown. With that alone you can't really ask for much more but Basel also provided my first live SABR which sends the crowd into delirium, decent weather, good food and plenty of other things to see and do. I arrived in Basel on Wednesday evening just in time to see Nadal vs. Dimitrov on TV, another 3 setter for Nadal which Dimitrov could easily have won. So Thursday was my first day at the St. Jakobshalle stadium and just like in Halle Kohlschreiber put up some stern resistance. I expected an easy match indoors but it was anything but as Kohlschreiber played the better tennis in sets 2 & 3. Federer was far from his best too and like I said in the comments on my last post you could see tape on his back when serving. It definitely wasn't the sort of match that filled me with confidence for the next few days but a win is a win and thankfully Kohli played a sloppy service game at 4-4 in the third which made the difference; very much the story of their H2H and maybe even their comparitive careers. Seeing this match live was somewhat unexpected as we only had tickets for Thursday and Sunday upon arriving in Basel but decided to see if we could snap up any on the day – and luckily landed 2 tickets from the box office and saw all 4 quarter finals. This was a crazily long day with every match going three sets and Roger not starting until around 10pm; fortunately we planned ahead so bought in food to prepare in the apartment as finding anything other than a dirty kebab or McDonalds at midnight would have been impossible. After not looking great against Kohli I wasn't sure what to expect from Fed as Goffin is a tricky customer but the Swiss played some great stuff in set 1; set 2 was a bit of a letdown but he buckled down in the third to close it out and setup a semi final encounter with Sock who defeated Donald Young earlier in they day. Nadal again went three against Cilic but he was somehow finding a way through. This was my SRF TV match of the trip and turned out to be a smart choice as the Semi Finals weren't the best matches of the week. Gasquet vs. Nadal had some high quality moments but same old story for Reeshard as he didn't make the most of being up a break in both sets. Gasquet was easily in the best form out of all the guys I'd seen play but Nadal's extra effort to make one more ball paid off and got him through in 2 tight sets. The second semi was then Federer vs. Sock and it was fairly routine. Federer didn't really have to push himself in this one but again he didn't look in great form missing a lot of running forehands and not serving that well. Sock doesn't have the all court game to really bother Federer though and you can tell Roger knows that the American's game will leak errors if he applies enough pressure. 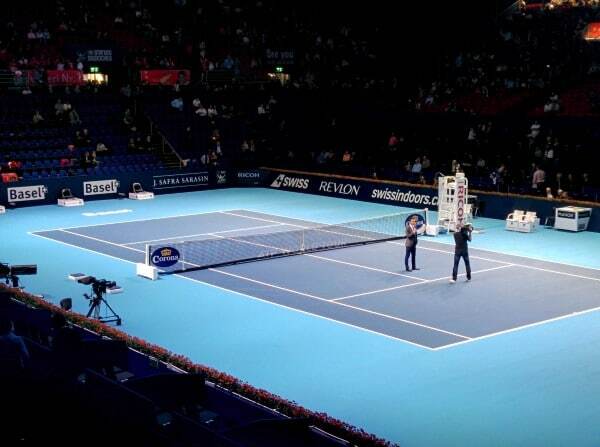 So the match tournament organisers, the Basel crowd and most tennis fans wanted when the draw came out was set. Needless to say I was excited but also a tad nervous as Nadal, although dropping sets for fun, was finding ways to win matches like he always does. We arrived at the Stadium at about 12.00 to catch some of the doubles and it was already pretty packed. The trams were overflowing and the place definitely had a buzz about it as even the part time fans and corporate bods know there's a lot on the line when these two meet. After a quick ice cream trip to the Movenpick stall it was 2.15 and time to settle in for the final. The seats filled up at lightspeed and by 2.20 there was barely an empty one left. Like the first 2 days I was again seated behind the baseline towards the corner which is my favourite angle to watch. I won't go into the build up as it's just standard fare for all ATP tournaments but Fed's reception was mega and it must be a huge boost, plus some added pressure to know that 99.99% of the stadium is on his side. The warm up was certainly an interesting one as both guys hit the ball big. Nadal is known for ripping forehands in the warm up anyway but Fed wasn't just floating balls in like you often see, it was aggressive hitting from both. Into the match then and my fears that Fed wasn't playing well this week were soon dispelled as he started the match peRFectly, hitting his running forehand well, taking it early and hitting a lot of backhand drives into the Nadal backhand which allowed him to keep himself on the front foot in the rallies. Nadal was of course playing in his usual swashbuckling style but Fed was in virtually every return game and broke the Spaniard twice en route to dominating the first set 6-3. Set 2 again saw Federer execute his plans down to a tee and it looked as though he was going to cruise over the line but just like countless Fedal matches, if you don't make the most of some opportunities, Rafa will make you pay and he did just that. Digging himself out of countless holes on serve before breaking at 5-5 and serving out the set 7-5. Horrible set to lose for Federer and for the fans too as it looked like a done deal up until 5-5. Ultimately Nadal just plays the break points to his tried and tested method and if you are going to be uber critical Fed was conservative on the break point chance he had which I think was at 4-4. Failing to go big on his forehands when he had the chance to rip them. Heading into the decider and it felt like a coinflip due to the history between the two but Fed kicked things off with a statement making hold. Like the first 2 sets it was again the Swiss looking the likely player to break but Nadal was holding firm. Roger then had to escape trouble on his own on serve but did so calmly which was great to see. Eventually Roger got the all important break, much to delight of the crowd and it was down to him to serve it out. No changeover just straight into it which probably helped and he played a really good game, even overcoming a serve being called out and overruled good by Lahyani that Nadal dumped into the net on match point. There was no need to worry though as Fed fired a serve out wide on the second match point which Nadal sent long and the crowd erupted. Come on! Then followed a typically Swiss trophy presentation with no pandering to corporate nobodies or thanking every man and his dog for making the tournament possible. It was straight to the trophies, a few short words from the players, including a weird comment from Fed to Nadal along the lines of “it's like you won the tournament” sounded a bit disingenuous but it probably just came out slightly wrong 😆 and then the handing out of medals to the ball boys & girls which is a nice touch. With the tennis bit out of the way I'll talk a little bit about the city and the stadium. 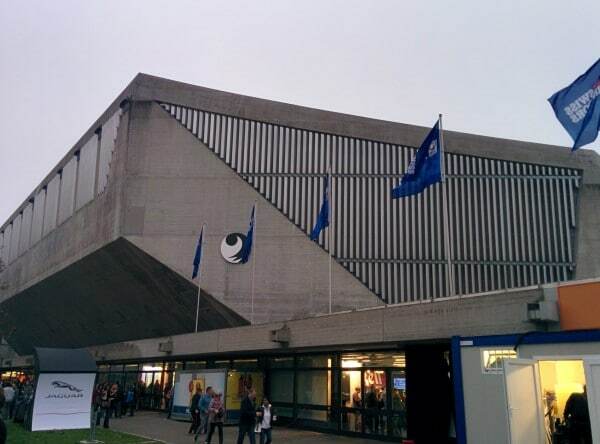 First up is the venue, it's the first time I've seen the St. Jakobshalle and it's a great place for tennis. Externally it's a bit of a 1960's looking monstrosity but inside it's well laid out and you feel really close to the action. The acoustics are good and when the crowd get going for Fed it provided a great atmosphere especially with the Mexican Waves giving it that carnival like feel. The tram stop is right outside too so it's very easy to get to from the centre of town. In terms of the offerings in the tribune area they were pretty limited but enough to keep most people happy. Corona obviously has an exlcusivity deal so that's the only beer you'll find which was a bit disappointing as a local beer would have been more appealing. Food wise it was just par for the course with pizza's, sausages, ragout, noodles and other snacks available. Pricey of course but looked alright, we didn't eat in the stadium though opting to find a decent lunch spot prior to play and taking in a few snacks to hold out until the matches were done. That's a better way of doing things as you'll get better quality, potentially save money and there's always a beer pretzel or ice cream to keep you going should you need it. Onto the city itself and I liked it, fairly clean, not massively crowded and plenty places to eat & drink. There's a decent market in the main square selling local produce, a good offering of shops from independents to the usual high street fodder and plenty supermarkets if you're staying in an apartment and need some essentials. It's very easy to get around too as the city operates a tram system which as you'd expect runs on time and just works. Tourists get a mobility card for the duration of their stay as well which means free trams and buses throughout the city. No need for a rental car really unless you're planning a trip out to the mountains for a day but a bike could be useful if you want to avoid public transport. It's not a massive city either so you could comfortably cycle round the main parts in a day. Pffiferling Deli – good lunch spot, quite expensive around 30CHF per head for lunch + drink but really well made, a nice interior and good quality ingredients. Restuarant Pinar – Turkish restaurant, good portion sizes and well priced. Tibits – a help yourself type place where you pay for the weight of your plate, think it's a chain which I normally don't like but this was good. Fischerstube – home of Ueli Beer which is Basel's local beer and tastes great. Food here looked quite good too. Consum – good place for drinks / lunch right next to the River Rhine. Basel Munster – nice building and you can cross the river on a boat for a 1.60CHF which makes a change from on foot or via tram. I didn't do any of the typical touristy / sightseeing stuff but Marktplatz & Barfüsserplatz have good markets, old style buildings and plenty of bars with outside seating for people watching 😉 which IMO is far more fun than having to mingle with other tourists opting to take pictures of pretty much anything they point their camera at. If you walk along the river there's some nice buildings as well to check out like Basel Munster I mentioned above. Architecturally there's a lot of modern buildings on the outskirts made from pure concrete so it's not the best city from that standpoint but there are plenty of older traditional ones dotted around especially in the centre to take a look at. I've not been able to really read much press due to a poor Wi-Fi connection but I saw Roger's comment that he felt tired vs. Kohlschreiber and Sock which meant he wasn't sure about Paris but now he's raring to go. He should be pretty confident going into this now after taking down Basel but it's a slower surface which reduces his chances somewhat. I guess we'll take it one match at a time but he looks primed for a run to the latter stages. Hope you enjoyed this quick recap and if you have any questions about Basel, be it the tennis or the city itself feel free to ask in the comments. Hope you get to see him, just Seppi to get out of the way. Welcome home Jonathan! So glad you got to see our guy win. Sounds like you had great seats too. Saw there was some talk in the French press of a “new” St. Jakobshalle in 2018 – you see anything about that? What a great tourist-friendly idea, the mobility card. Thanks for giving us a little taste of the city as well the tennis. Yes, didn’t Roger say he was hoping to compete long enough to play in the inaugural tournament in the new hall, or something? I haven’t been in a long time, but I used to love the hyper- accurate hiking maps, with detailed gradients and every single chalet marked in its place. No (although I do). The ice-cream “M”. Oh! Tried to complicate it too much, didn’t I? Nah there wasn’t much info about the new stadium at the actual venue. I think priority for them is to sell tickets for next years event so they might not want to push something 3 years away just yet. Fourth. Clearly shouldn’t have stopped to read the Schweizer Illustrierte article! Hi Jonathan Sounds like you had a wonderful time and a wonderful view of all the action, so pleased he won had to record the match as granddaughters 3rd birthday party coincided with match I normally watch as though it is live but got to 5.oopm and I just had to look to see what the result was ecstatic when I saw that he had the win, as the smile went across my face the family said he won then!!! No.8! Great that you enjoyed the trip and witnessed Fed’s 88th title. An excellent recap and travel writing, good to read about the venue and Basel, too. Haha ‘delirium’ 😆 I can imagine the atmosphere must have been extra special in live in his home ground. Yeah the SABR gets the crowd going, people shout it out when he does it. SABRRRRRRR. Welcome back! We missed you. What did you make of Nadal’s looking at his watch during Fed’s speech (plus his weird head tics)? I actually think the draw is not bad for Fed in Paris. I thought that was extremely rude, am I alone in thinking this? No, it was rude. So much for his so-called respect for Federer. What made me mad is that some people tried to blame Federer for wasting Nadal’s time by addressing his home crowd in both French and then Swiss German. Karen: “some people tried to blame Federer for wasting Nadal’s time…” what – who? – I never saw any of that? Where? – I think it only slashes back on neurotic Rafa himself, so never mind – ? Nadal is not neurotic. I looked at that part of that video more than once just to make sure I was not seeing things. Nadal looked at his watch after picking something off his clothes and made an annoyed facial expression as if it to say, “Really?” Nadal and Federer need to be seen as a friendly rivalry for some reason, so is being seen as Nadal being neurotic or its just one of his tics. Nadal needs to understand that he and Federer are what they are, because of the fans. Imagine a world with no tennis fans. What would he be? So what if Federer took a couple of extra minutes to address the fans? Federer could not have been more magnanimous in his praise, when he said it almost feels like Nadal won it. I never believed Nadal ever had any respect for Federer, no matter the words he has uttered. He hates losing to Federer, more than he hates losing to anyone else. Actually, he hates Federer. Or, perhaps it was time for him to get his customary spanking from Uncle Toni, every time he loses to Federer? Sounds like he was looking forward to it. Yeah, I don’t see Nadal “wasting” time addressing to his countryfellows in castellano, catalan, gallego and basque. Anyway, I’ve been a few times in Switzerland and I will not say anything very original: the landscape is nothing less than breathtaking. In 2003 I’ve been at Jungfrauhoch, in a clear February day, where I for the first time I fell my heart pounding due to the low oxygen concentration. At that occasion I was staying in Luzern (it was the carnival week). I was waken up at 5 AM Thursday with a loud bang signaling the official start of festivities, that lasted until Sunday, when the main parade took place. Everyone was dressed up during the whole week. One one morning at the hotel, when I was going to have breakfast, as the elevator doors opened, a guy all dressed up as band player blew a loud trumpet note straight onto my face and then shouted “Stop!”, which made me instinctively jump 1 meter back. Lots of laughs. Later on, apfelstrudels. I thought it was a bit thoughtless, but it really just looked to me like “can I still make Paris tonight?”, & then only because he happened to catch sight of the watch. Don’t know if the really bad fog was forecast or not; I did see something in the French press suggesting Fed was actually delayed a day because of it. I’ve looked at the situation 3 times, and IMO it can be both. Would he really dare to be that rude in Roger’s home-court? Maybe so. Well, he seems a neurotic person to me, his rituals before serving (well taking less time now), mimic/tics on several (pressed) occasions etc. Could be side effect of possible drug-habit/other pains. Although now I’ve just seen the gif of Rafa – what to even call it? – jerking his head sideways in the background while Roger is speaking. I didn’t realize it was more than just the watch-checking. Even if not intentionally rude, this is – a surprising lack of respect for the tournament, whether it’s Roger speaking or not. Uh, Rafa? People are still watching even though you’re not the center of attention at this precise moment? You’re not actually backstage? He looks at his watch and sorta gives it the ah not bad look. As though he knows he has doubles on Tuesday with Paes or was thinking it was a bit later than it really was. Tbh I don’t really care that he looks bored – we’ve surely all sat in meetings or whatever and done similar. I’d prefer to see true colours rather than just pretending to be loving every minute of a speech you don’t understand in a final you just lost. If anything I found it funny. I’d like to see the comments if Fed did same. 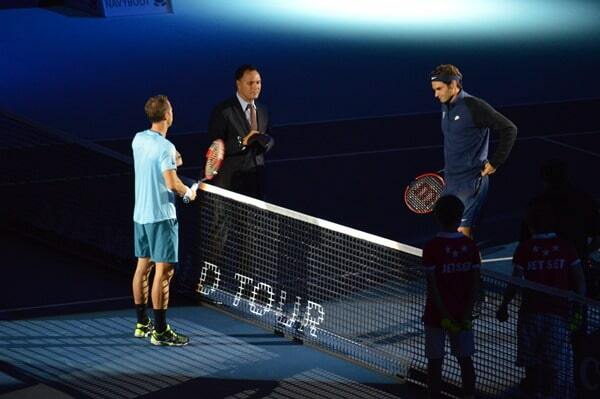 LOL @ Roger looking bored, OMG he’s such a diva. Well, exactly – the watch part, meh, okay. But look at the last one of these in particular – what is he DOING? Welcome back Jonathan. .. Basel’tov Basel’tov.CoConsidering the PeRFect result andyyou getting to see Federer beat Nadal and lift the trophy for the 7th time. For you Jonathan, and all of us Federer fans a fantastic outcome. Yes yes yes. 88 titles and counting. .Itwas worth the wait. I hope federer can take this momentum to Paris. I hope to God that Djokovic doesn’t win it. Please let it not be him. Fingers crossed. Allez Federer. Great write up Jonathan. I too love the crowds adulation for Fed, its a special thrill. I am still on cloud 9 for #88. Welcome back Jonathan. It must have been a thrill seeing our champ win that trophy over the Spaniard. I can imagine the atmosphere must have been electric. Yesssssss! I am so happy for Fed. I think I have read every article re the win. (Silly me) . Happy for you that it was an enjoyable trip. What a brilliant result all round! Glad you saw him win! Must say I was worried at end of 2nd set cos Nadal had been squeezing out the wins but Tog stood v firm on serve. Guessing to go the right way to set up the 2nd match point was massive, just massive as Nadal was sniffing a break …..
Paris court looks like sludge. Makes for awful watching so far. I don’t get my hopes up here, little prep and slower than slow courts…. Poor combo for Rog! Roll on London and what Cld be a fascinating draw given Rog likely to be 3rd seed unless he wins Bercy… Imagine a group with Novak/Nadal and Rog….. Entirely possible! This win is close to a Wimbly win, beating Nadal on home turf. How good is that. Must admit, couldn’t watch it live. Had to check the score periodically and then watch the replay. Too bad the outskirts of town consist of concrete buildings. Looks very quaint in the centre. Good on you, Jonathan for lucking out with this Fed fan trip! Green with envy. There’s the big Novartis Campus and CIBA (where Fed’s Dad worked) area so a lot of large newer buildings. Great stuff Johnathan, lots of envy here! In general you guys in Europe are so lucky to be treated with so many high quality tournaments just at your door step! In the last few games I was pretty much too scared to watch. I was squeezing my blankets in bed, praying to God and peeping at the screen every now and then. I was over the moon that Fed pulled it through. it’d have been disastrous if he didn’t and can you imagine what it’d do to his confidence, after the heartbreaks at USO and Shanghai! I don’t have any expectation for Paris. Just hope he enjoys it, plays healthy and prepares well for London. 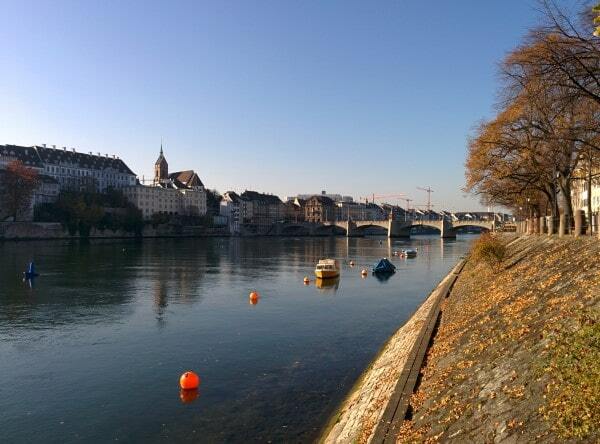 Thank You Jonathan for that very personal write-up on Basel – great to read! And April, you are right: of all tournaments to lose in a final to Nadal, a Basel final loss to him would have been horrific, damaged Roger’s confidence, kept Roger at Number 3, deprived Roger of an 88th tour title, would have ensured Roger would not join the Sevens Club like four other tournaments now at that figure or above, and would not have bettered last year’s five titles won ( now six, and counting? ). It would have definitely cemented Nadal as ‘being back’ amongst many not to mention putting a big question mark on Roger’s imperious indoor career record and to give Nadal only his second ever career indoor hard court tournament win. Phew, Thank You Roger for not letting that happen. Regarding Paris, which like Shanghai is not one of Roger’s favoured tournaments, he hopefully will get to semis ( but must be wary of possibly Isner en route ). If he meets Murray there, there will be added spice as each will be competing for Year End Number 2. In any event, should he get to final and that pest the Joker is there, sadly the latter will win and be smug in becoming the first man to win six masters in one calendar year…sigh. But! I really think Roger will put the kitchen sink into winning the Year-End Tournament for a seventh time ( then six tournaments won seven times each except Halle which is eight ). And if it means beating that pest that is Djokovic to do so, I am plumping for our Roger!!! 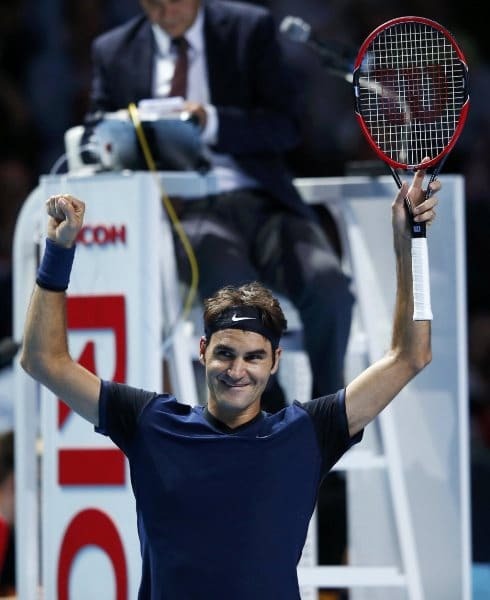 As for the O2, I agree, based on Fed’s interview it certainly looks like he has one eye on London…. Liked your headline, Jonathan. But where was the selfie with the champ? If he lets the ball-kids take them then surely his main man could get one. Must have been something else for you to be court side. A friend who went to Cincinnati said watching Roger ‘live’ brought home what a ‘beautiful’ player he is. I bet you were on the edge of your seat at the end of the second set, and when Roger missed his first break opportunity in the third. I was fearing a ‘choke’, but it was Nadal who blinked. That close. By the way, were you impressed at the court coverage and power of the ‘injured’ Nadal? To me, he looks back at his physical peak – the decline magically reversed. I can’t think of anything worse than a selfie. They would be banned at the peRFect Tennis Masters 1000 event. I was more impressed by Fed’s speed to the net rather than Nadal’s court coverage. I’ve seen Nadal play play plenty times, but never seen Fed come forward as much as he does now, he gets there in quick time and covers the net better than anyone. Welcome back and thanks for the writeup. I think Fed played great and Fed’s serve was working.He raced past his service games very quickly and it was so nice to see Fed playing wonderful in third set . This is a small tournament but I think it’s a huge win for Federer and it will boost his confidence a lot for the last 2 tournaments.Fed said after the semis that he had a clear game plan against nadal and although I can’t figure it out but Fed’s first set was a little different.He didn’t slow any point and continuously hit deep backhands which put Nadal on the back foot. I just had a question,I don’t know this rule but that first match point which Nadal hit on the net should have been Federer’s .Nadal anyway wasn’t able to play to play that point . The main thing is the guy called out was after Nadal dumped it in the net,so am I wrong in it. The greatly anticipated write up Jonathan with that special Basel flavour! thank you. All felt so very special and you being there to bring back courts side and travel musings was novel! They do it so well and it can only be because of Fed being there so often that it has become so GR88! It is a Swiss version of classy and futuristic, historic echoes of Wimbledon with the trophy and ceremony, the other worldly lit tennis courts and fast surfaces and the ball kid medal ceremony freshness, linking the champs to the promise of the future. Charming and memorable. The reverie seems destined to pass quickly as we see Bercy(fugly) and players like Stan and Tomic both almost trying to lose their matches on treacle slow surfaces, dreary!! Can we hope for a renewed Rafa to trounce Novak maybe -anyway trust Fed performs well and we get through to WTF unscathed. Seems quite a few are playing doubles too – Rafa again, Berdych, does this mean a bit of net play is being sharpened up ? 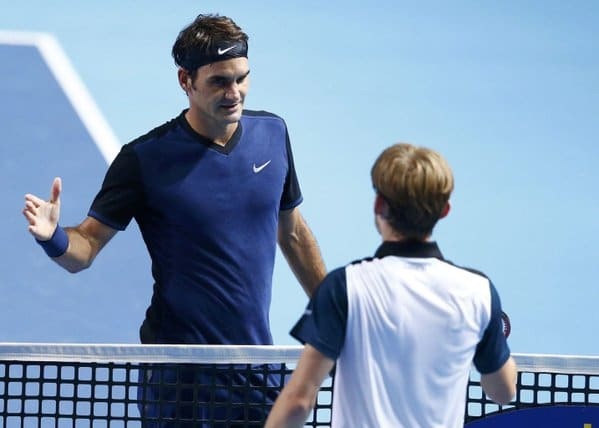 Whatever, Basel was a triumph and masteRFul effort may it be the platform to future success for the Fedberg era. How dare Fed didn’t ask you for a selfie? Didn’t even get a slice of pizza either ffs. Cute. Never get tired of it. Welcome back Jon, missed you! Great post and what a great week for Roger. For a while I was worried about Roger’s back and lack of concentration. He got the ship right just in time. Hope this will spur him at Paris to go deep. Its a good win against Nada and about time. I can imagine what will happen if Nadal won instead, probably gave him the boost he needed after a horrid season. I am so glad Roger manage to turn around his nerves against Nadal with home crowd helping him. I hope for more positive stuff at WTF. Paris is just a stopover for me but it would be nice if he can go deep and hold on to his no 2 position. If Nadal had won I think I’d have jumped into the Rhine. Hey Jonathan, Was Mirka at any of the matches….nosy me. Wonderful outing today for Fed against Seppi! Did anyone get to see? Thanks for all the analyses. 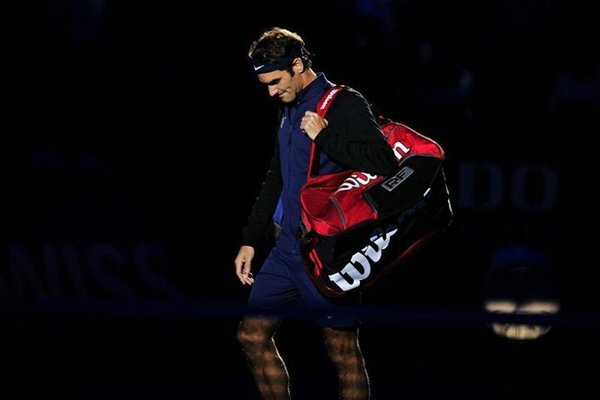 Agree totally with Paul Z about the implications if Roger had lost the Basel final. He was clearly determined to win that one and he did – thank goodness. Just a word about the St Jakobshalle, however: I wasn’t there this year, sadly for me, but when I was there in 2011 the food in the main restaurant I found was magnificent – a buffet with every kind of freshly-prepared hot and cold dish, and champagne or other wines on sale in several places. There was also fast food, but that was by no means all. It was exactly what you expect from Switzerland. Unless it’s changed (?) it’s well worth a visit for that as well as the tennis! Plus the lovely city of Basel, of course. Yeah you’re right about the restuarant, I forgot to mention there is one in there in a closed off area. I didn’t try it so can’t really comment. Moet was the Champagne on offer alongside Corona as the beer. I think out of all the venues I’ve attended Halle had the best food options – more of a local feel to it. Damn John “Skyscraper” Isner had to spoil the fun by beating Federer in the 3rd round. Considering that yesterday he played flawless today he played pants. Lol 🙁 But this might be a blessing in disguise for the WTF as it will give him more time to recover from his back injury and give him practice to brush up. Hopefully the Wtf he will play like the champion he is. But if he can somehow win it it will be fantastic if no. 7 title Wtf to along with the other tournaments his won 7 times. This will definitely make the 2 GS losses to Djokovic much better. Come on Roger you can do.